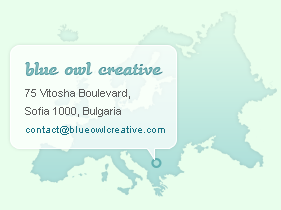 BlueOwlCreative is a small, Sofia-based web design studio. We produce innovative and exciting websites characteristic for their clean web design and user interfaces that are usable, accessible and rich in user experience. BlueOwlCreative was founded by Kalo Yan - a passionate about web design and development fellow that has an eye for detail and creates unique websites that are pretty, functional and user friendly. At BlueOwlCreative we use tools that have proven worthy to transform your ideas into functional, appealing websites - detail-oriented, attractive design combined with the latest technology, focused on usability and web-standards. We communicate to you through the entire process - from the very start of the design concepts, through the database design and functionality coding, to the completion of the entire project in order to deliver ultimate results and to even exceed your expectations. We love new ideas and would like to hear yours! We blend in professionalism and friendliness, creativity and technical skills in order to deliver optimal results and would love to hear from you if you are thinking about working with us. Drop us a line here. Testimonials"On extremely short notice, BlueOwlCreative came up with the perfect design I previously envisioned for my company. Thank you for the personal touch, understanding and responsiveness to all our needs!"